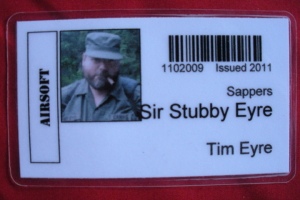 Airsoft Photo ID Cards are being issued. Make check in for your next Camp R & R event that much simpler for both you and us. When you show up for an event at Camp R & R you can simply present your Airsoft Photo ID Card at the check in and let us scan your card to activate your waiver instead of having to fill out one every time. Please click here to fill out ID information form so that all we have to do is take your picture and print your card.